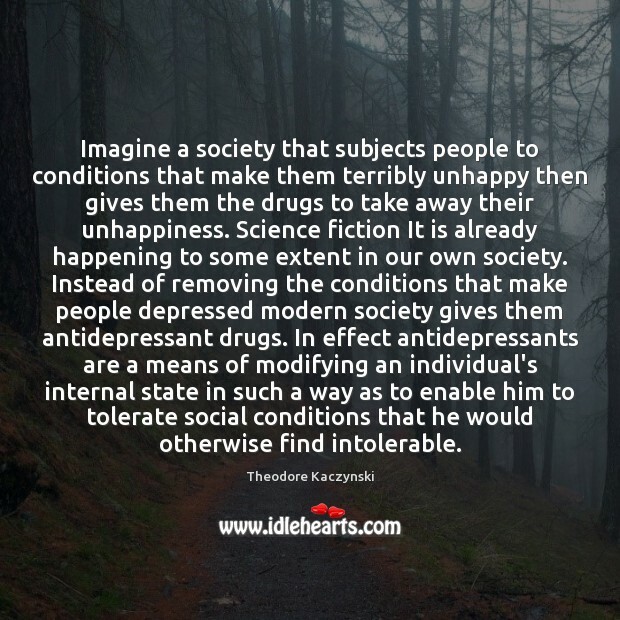 Quotations about Antidepressants. Quotes to stimulate mind and drive action! Use the words and quote images to feed your brain inspiring things daily! 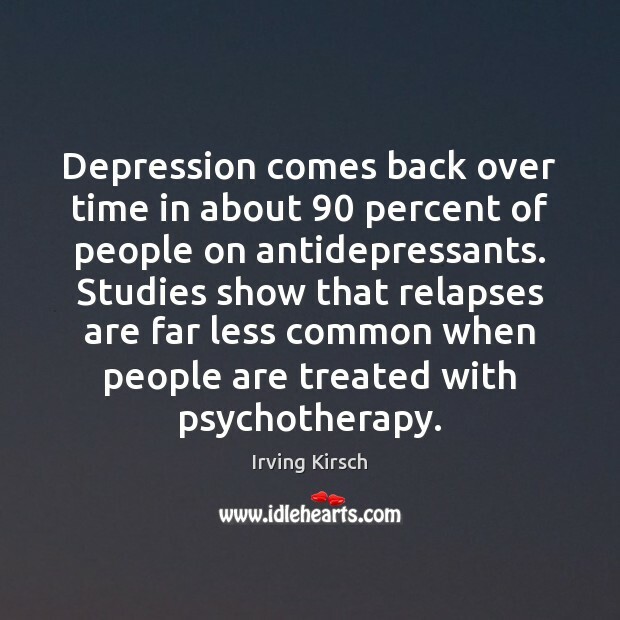 Depression comes back over time in about 90 percent of people on antidepressants. Studies show that relapses are far less common when people are treated with psychotherapy. 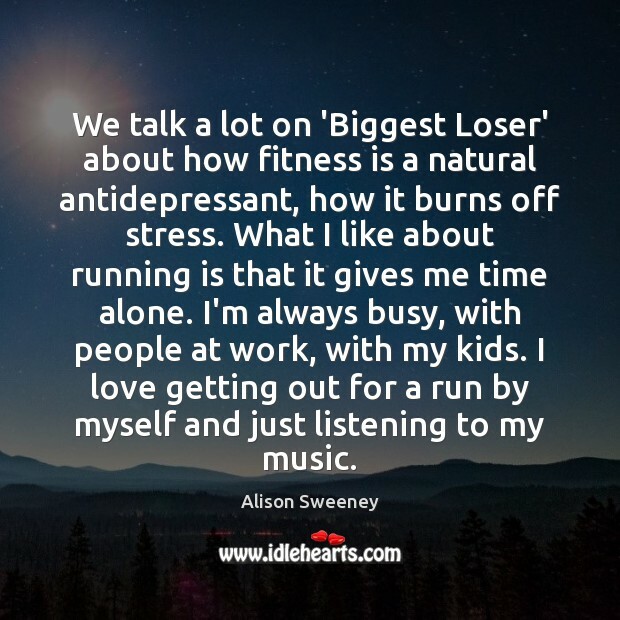 Antidepressants. The thought of this girl actually being depressed made me want to grab the whole planet and throw it into the sun. Well, more than usual anyway. 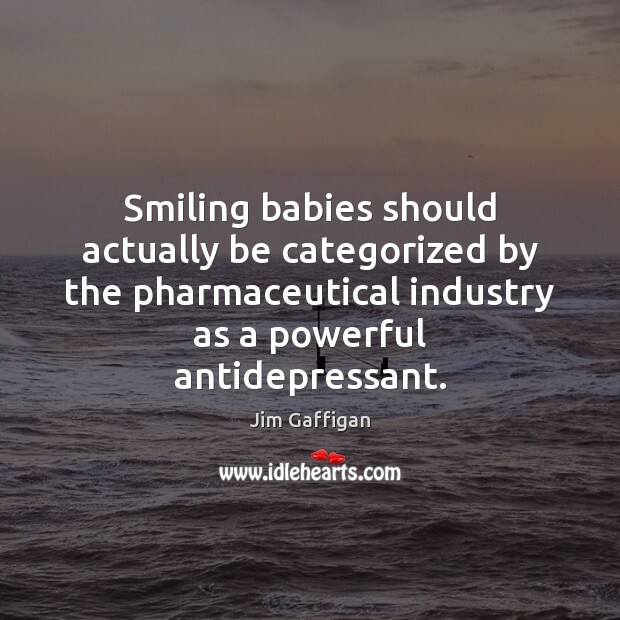 Smiling babies should actually be categorized by the pharmaceutical industry as a powerful antidepressant. 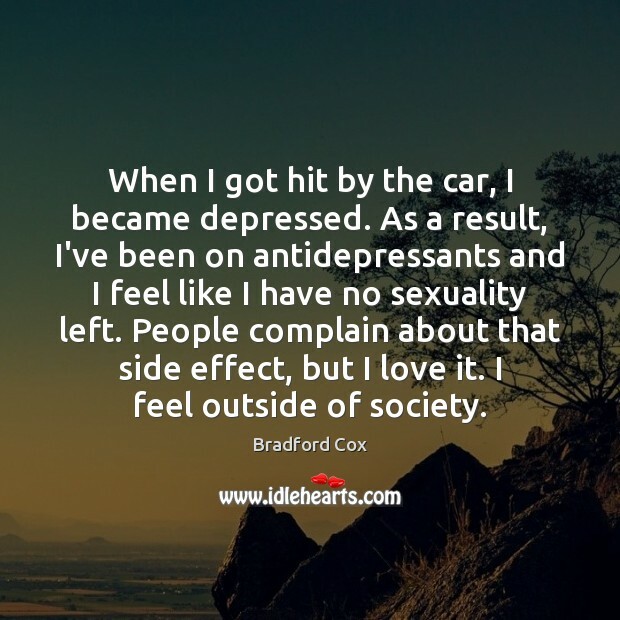 When I got hit by the car, I became depressed. As a result, I've been on antidepressants and I feel like I have no sexuality left. 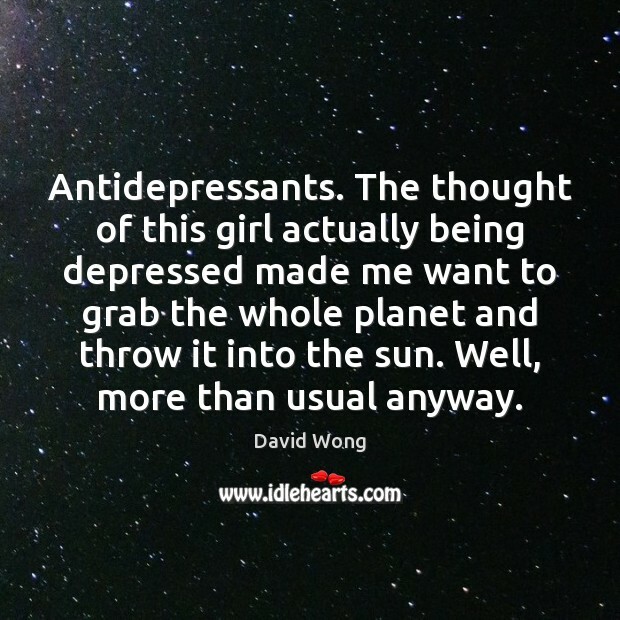 People complain about that side effect, but I love it. I feel outside of society. 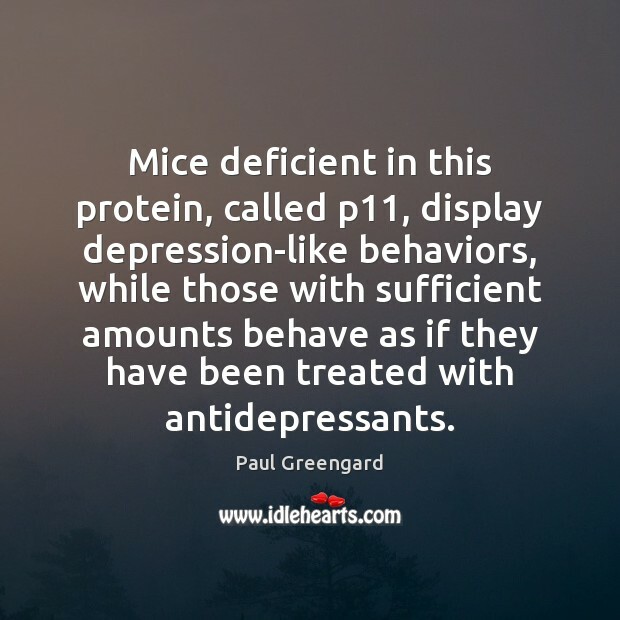 Mice deficient in this protein, called p11, display depression-like behaviors, while those with sufficient amounts behave as if they have been treated with antidepressants. Suicide rates have not slumped under the onslaught of antidepressants, mood-stabilizers, anxiolytic and anti-psychotic drugs; the jump in suicide rates suggests that the opposite is true. 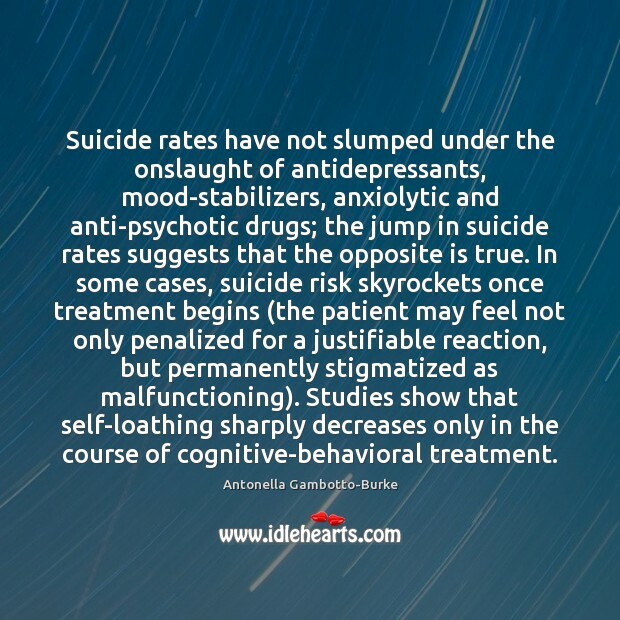 In some cases, suicide risk skyrockets once treatment begins (the patient may feel not only penalized for a justifiable reaction, but permanently stigmatized as malfunctioning). Studies show that self-loathing sharply decreases only in the course of cognitive-behavioral treatment. 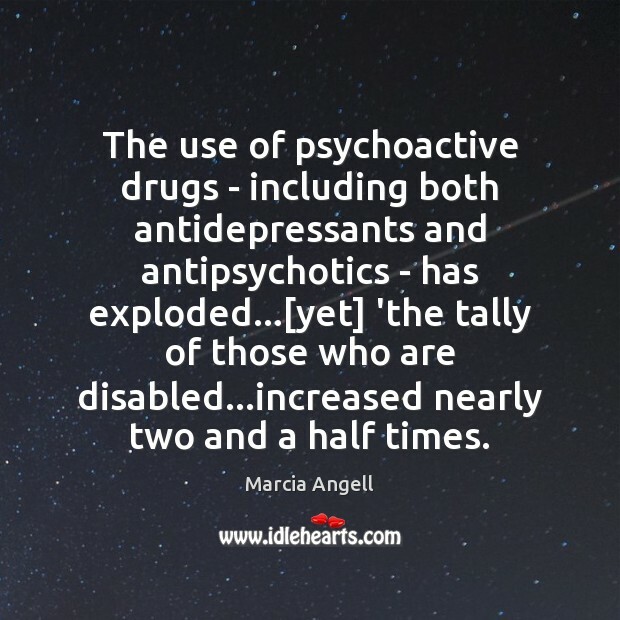 The use of psychoactive drugs - including both antidepressants and antipsychotics - has exploded...[yet] 'the tally of those who are disabled...increased nearly two and a half times. 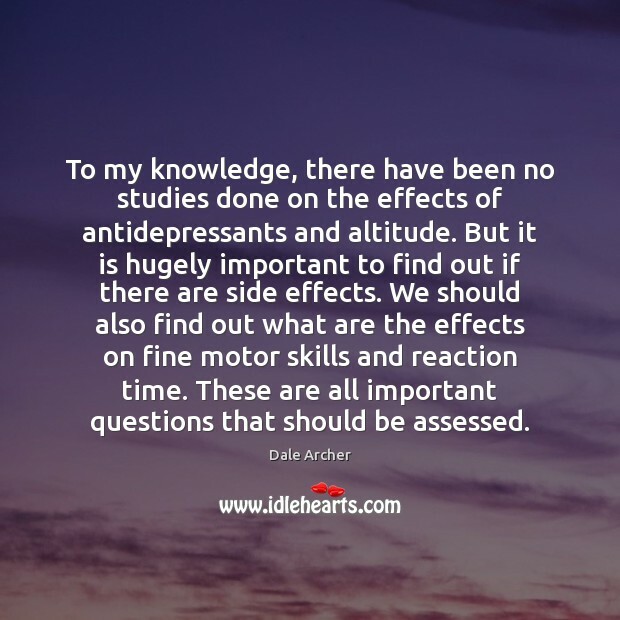 To my knowledge, there have been no studies done on the effects of antidepressants and altitude. 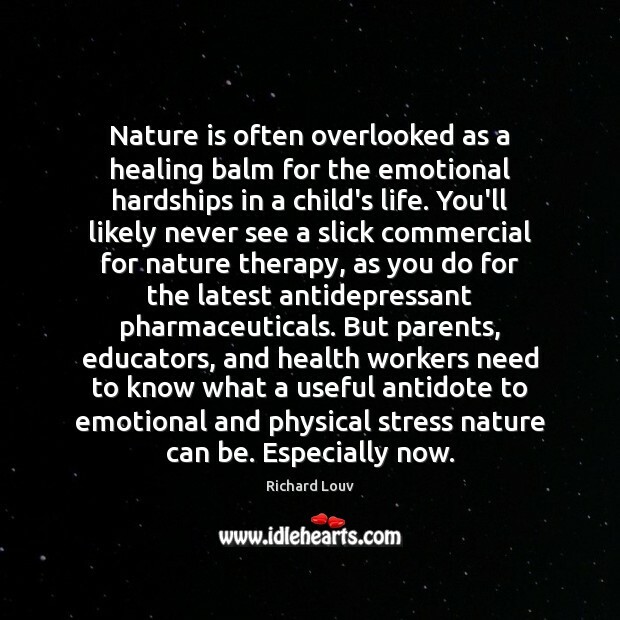 But it is hugely important to find out if there are side effects. We should also find out what are the effects on fine motor skills and reaction time. These are all important questions that should be assessed. 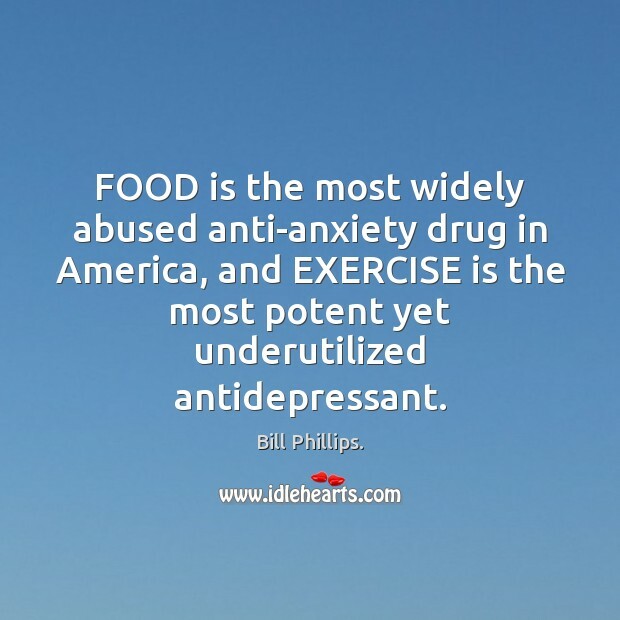 FOOD is the most widely abused anti-anxiety drug in America, and EXERCISE is the most potent yet underutilized antidepressant. 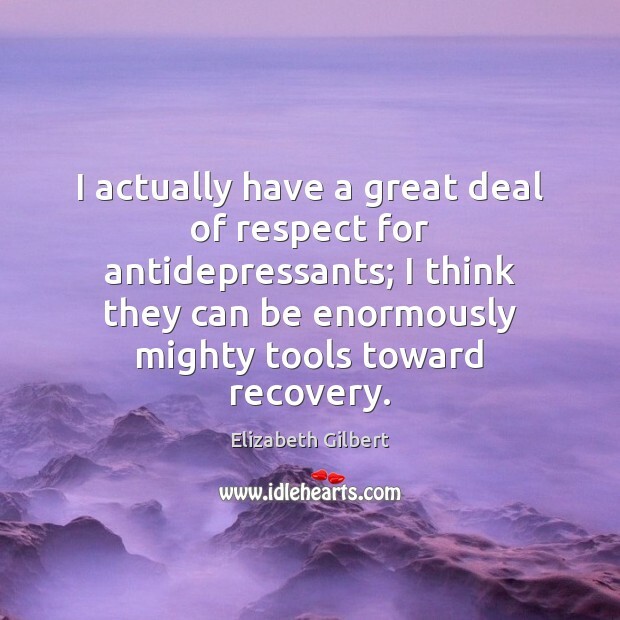 I actually have a great deal of respect for antidepressants; I think they can be enormously mighty tools toward recovery. All I know is it’s silly to chase fun when all you need is the ground underneath you to be solid. And I don’t expect to be one of those people that does cartwheels in yogurt commercials. I wanna be the cartoon character in that antidepressant ad who has, like, little lines under her eyes, and the divot in the middle of the pill is the pill’s mouth... have you seen this ad? It’s very good. 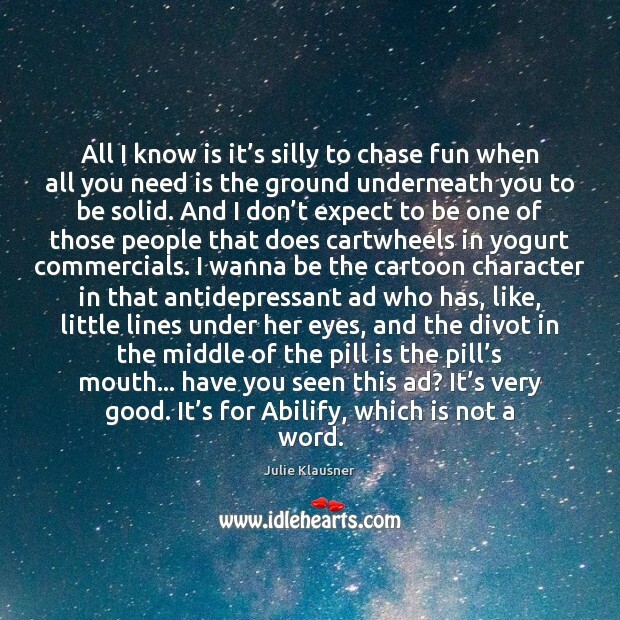 It’s for Abilify, which is not a word. 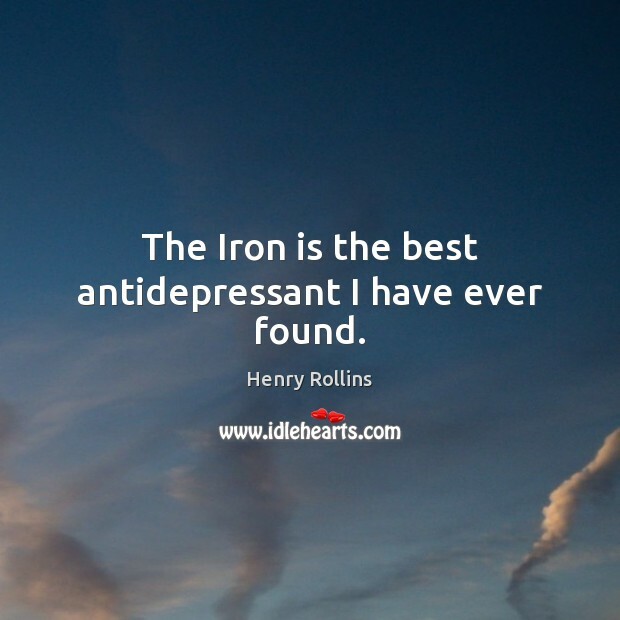 The Iron is the best antidepressant I have ever found. 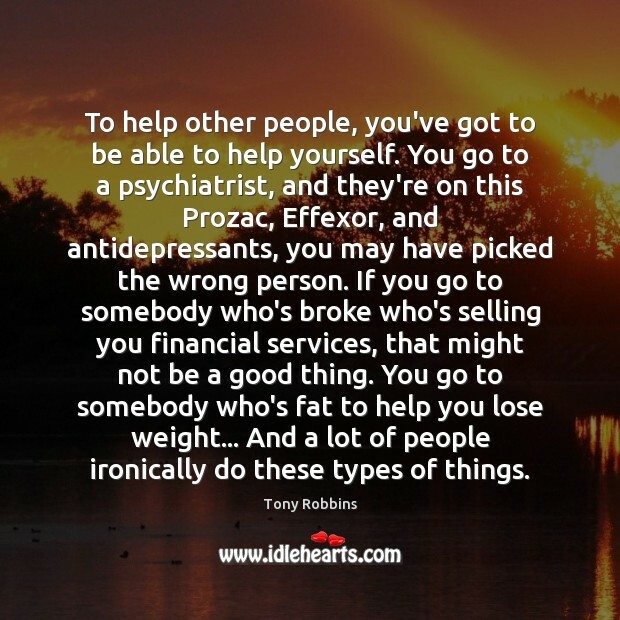 To help other people, you've got to be able to help yourself. 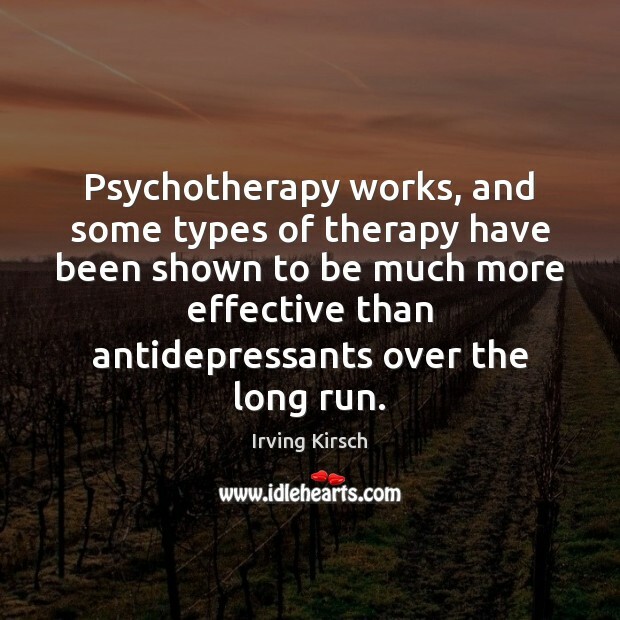 You go to a psychiatrist, and they're on this Prozac, Effexor, and antidepressants, you may have picked the wrong person. If you go to somebody who's broke who's selling you financial services, that might not be a good thing. You go to somebody who's fat to help you lose weight... And a lot of people ironically do these types of things.